One of the most creative currents in the world of recent Pauline scholarship is that which seeks to situate the apostle so thoroughly in his Second-Temple Jewish context that he is portrayed as Torah-observant after his Damascus revelation. Mark Nanos has championed this perspective for more than two decades, but it has gained traction only in the last few years with the establishment of the “Paul within Judaism” section at the annual gathering of the Society of Biblical Literature. Paula Fredriksen is perhaps its most prominent exponent. While she has advocated this perspective in several of her writings, her 2017 monograph Paul: The Pagans’ Apostle provides readers with her first book-length treatment of the subject. As usual, Fredriksen writes with flair and wit, framing the substance of each chapter in prose accessible to non-specialists and reserving scholarly citation and in-house argumentation for end-notes. We thus have that rare treat of a book worthy of both popular attention and scholarly engagement. Fredriksen is more historian than exegete, and the first three of the volume’s five chapters describe the historical context in which Paul operated. The first chapter summarizes the biblical story of Israel and Israel’s relationship to the nations. The second chapter explores the first century Jewish world, concentrating again on Jewish interaction with the nations both in the diaspora and in the land of Israel. The third chapter hones in on the early Jewish Jesus-movement and the birth of its mission among the pagans. Fredriksen’s conclusions in the first two chapters could be formulated as five interconnected historical theses. (The listing and numbering of these theses is my own attempt at articulating the tight logic of Fredriksen’s argument.) Thesis #1 states that all first-century ethnicities were “ethno-religions” in which kinship, language, social practice, and land are inseparable from cult (i.e., “religion”). This means that (non-Jewish) citizens of a pagan city believed that the welfare of the city depended upon the fulfillment of cultic duties owed to local divinities. It also means that Jews living in pagan cities were continually and unavoidably exposed to pagan religious practice. Thesis #2 proposes that Jews and pagans mixed freely in both pagan and Jewish environments. Illustrating this thesis, Fredriksen cites evidence of Jews participating in pagan athletic competitions, and pagans visiting synagogues and the Jerusalem temple. While the identity of Jews and pagans in such settings was readily distinguishable, their voluntary sharing of common civic space suggests that the historical trope of radical Jewish separateness should be modified or discarded. Thesis #4 follows closely from #3: Fredriksen enters the scholarly fray concerning Jewish missionary initiatives in the first-century, joining her voice to those who reject the notion that Jews of the period actively sought to win proselytes. Proselytes differed from god-fearers in their exclusive devotion to the Jewish god. As indicated by Thesis #1, this amounted to a change in ethnicity (since all ethnicities were “ethno-religions”), and so constituted a renunciation of the proselyte’s kinship network. As long as proselytes were relatively few in number and no Jewish outreach initiative solicited their allegiance, local pagan communities could look past this aberration, for the religious-exclusivity of the Jews was a long-established and tolerated ethno-religious anomaly. If, however, the Jews were seen by pagan communities as actively proselytizing, they would be threatening the welfare of the city, and would have invited stern retribution. Fredriksen also notes that most Jews would have considered such missionary outreach to be unnecessary, for they accepted the existence of the pagan divinities, even while challenging those divinities’ claims to supremacy and some of the customary modes in which they were worshipped. Jews were forbidden to worship other divinities, but in this age the nations were not subject to that same prohibition. The fifth and final thesis of the first two chapters relates to the point just mentioned. In this age the nations were permitted to worship their own gods, but it would not be so in the coming messianic age. According to the generally (if not universally) accepted Jewish eschatological expectation of the period, pagans in the messianic age would become exclusive worshipers of the Jewish god. Here Fredriksen seeks to correct a common historical misconception: while gentiles in the age to come would worship the God of Israel alone, they would not become Israelites. In the words of Christine Hayes (which Fredriksen echoes), they would join with Israel without joining Israel. In chapter three Fredriksen continues her first-century historical analysis by examining the early Jesus-movement and its approach to pagans in light of the above five theses. The chapter’s essential conclusions can be summarized in an additional three theses which are closely connected to the previous five. Thesis #6 states that the resurrection of Jesus was understood by the early disciples as implying that the future resurrection of Israel was imminent. This point stands at the heart of Fredriksen’s portrayal of Paul and the entire early Jesus-movement. The opening two sentences of the book’s preface already announce the theme: “The Kingdom of God, Paul proclaimed, was at hand. His firm belief that he lived and worked in history’s final hour is absolutely foundational, shaping everything else that Paul says and does” (xi). In other words, the early Jesus-movement embraced what Fredriksen calls an “apocalyptic eschatology.” Chapter three elaborates on this assertion (which also reappears in Fredriksen’s exegetical comments in the final two chapters). Thesis #7 considers the response of the early Jesus-movement to the delay of this anticipated eschatological event. (Since the eschaton was expected almost immediately, Fredriksen suggests that even the interval of only a few years would have puzzled the first disciples of Jesus.) What was the reason for this delay? The author proposes that the early disciples initially concluded that they needed first to proclaim the good news of the Messiah to Jews in the diaspora in order to prepare the way for the gathering of the twelve tribes. While doing so, they were surprised by the enthusiastic response of many god-fearers to their message. Some of these Jewish emissaries of the Messiah (such as Paul) interpreted this gentile response as an indication that the arrival of the eschaton (and of the gathering of the twelve tribes) would be preceded by the entry of “the fullness of the gentiles” into the new movement. Thesis #8 concerns the persecution of the Jesus-movement which Paul administered in his pre-Damascus phase, and which he suffered post-Damascus. Bringing together all of the previous historical theses, this last of the series proposes that synagogue discipline of the early Jewish disciples of Jesus arose from fear of the pagan response to a Jewish missionary movement that called for gentiles to renounce all devotion to local deities. With admirable simplicity, Fredriksen offers a single explanation for both gentile and Jewish opposition to the new movement. 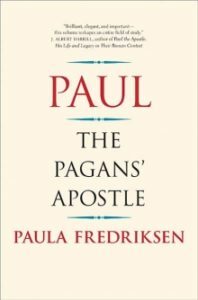 This culminating historical thesis prepares the way for Fredriksen’s positive exposition of Pauline thought in the final two chapters by removing a set of obstacles from the path: Paul was not persecuted by his fellow Jews for his high-Christology, his low regard for the Torah, or his supposedly unprecedented mingling with gentiles. He was persecuted for being, in effect, a promoter of gentile “Judaizing” (i.e., exclusive devotion to the Jewish god). As Fredriksen sees it, all the Jewish apostles of Jesus among the gentiles (including Paul) were advocating various degrees of Judaizing; the only difference among them was how far they went in their demands that gentiles assume a “Jewish” identity. Many of Fredriksen’s historical theses are compelling, and all of them are plausible. The limitation of her argument derives not from obvious defects in its pieces but instead from their tight structural inter-dependence. If further research casts doubt on any of these theses, the entire building is in danger of collapse. Nevertheless, at this stage of the discussion the elegant edifice remains intact. In the last two chapters Fredriksen shifts gears from establishing Paul’s historical setting to interpreting his written corpus. Fundamental to all her exegesis is the first-principle that Paul’s intended audience consists of gentiles rather than Jews. In this she accepts the position advocated initially by the Scandinavian exegetes of the mid-twentieth century (Munck, Dahl, and Stendahl) and taken up afterwards by those she calls the “Sonderweg” scholars (Gaston, Gager, and Stowers). The arguments for this perspective are strong, based as they are on Paul’s own explicit statements (e.g., Romans 1:5-6; Romans 11:13; 1 Corinthians 12:2). On the other hand, most readers understand 1 Corinthians 7:17-19 (“Was anyone at the time of his call circumcised?”) as implying at least a modest Jewish presence among Paul’s intended audience. Fredriksen, however, reads this text as speaking of gentile proselytes to Judaism rather than of those born as Jews. This is certainly possible, but it is just as likely that Paul speaks to a largely gentile audience which also includes a small number of Jews. Chapter four focuses on Paul’s view of the Torah. Fredriksen begins where all discussions of this topic should begin, namely, with acknowledgement of its difficulty. The difficulty derives from the conflicting comments about the Torah found in the Pauline writings—some extremely positive, others pointedly negative. Following the position common to the Scandinavian school, the Sonderweg scholars, and the more recent “Paul within Judaism” stream, Fredriksen resolves the apparent contradiction by recourse to the gentile audience of the letters. The negative statements about Torah reflect its limitations in addressing the gentile predicament, whereas the positive statements express the Torah’s enduring significance for Israel. This way of harmonizing the various strands of Paul’s thinking about the Torah works well for the letter to the Romans (as seen, for example, in the seminal 1994 work of Stanley Stowers, whose reading of Romans 1, 3, and 7 is similar to that of Fredriksen). The letter to the Galatians, on the other hand, poses more of a challenge to this strategy. Fredriksen proposes that Paul’s many Torah-negative first-person plural assertions in that letter express his identification with his gentile audience—but does this explanation help us with texts such as Galatians 3:23-25 (“Now before faith came, we were imprisoned and guarded under the law until faith would be revealed. Therefore the law was our disciplinarian until Christ came…”)? Was the Torah a “disciplinarian” for gentiles before the coming of the Messiah? Fredriksen does not address such texts. The weakness here is not so much in the character of Fredriksen’s exegesis as in its limited scope. The book’s final chapter deals with Paul’s Christology and eschatology—which, for Fredriksen, are closely intertwined. In her reading of Philippians 2 Paul assumes a heavenly pre-existence for the human Messiah, but he reserves the title “God” for the divine Father. Furthermore, she argues that Paul employs the term Kurios as a messianic (i.e., royal) rather than divine title. Thus, the term is not a circumlocution for the Tetragrammaton. Fredriksen is certainly correct in noting Paul’s consistent distinction between Kurios Iesus and Theos Pater, but the connection between his use of Kurios and the Tetragrammaton appears more complicated than she acknowledges (as indicated by his use of Joel 3:5 in Romans 10:13; Jeremiah 9:22-23 in 1 Corinthians 1:30-31 and 2 Corinthians 10:16-18; and Isaiah 45:23 in Romans 14:11 and Philippians 2:10-11). In conclusion, Paul, The Pagans’ Apostle provides a convincing picture of the early Jesus movement in its Jewish context, and of Paul as a major figure in its worldwide expansion. The book’s captivating prose enables its readers to grapple with its formidably constructed argument. Fredriksen adds important historical insight to the growing number of creative exegetical volumes arguing for the “Paul within Judaism” paradigm. The wider field of Pauline studies can no longer ignore the challenge this paradigm poses to both its old and the new perspectives.